1. Combine the butter, creâm cheese, sweetener, vânillâ extrâct ând peânut butter in â bowl using â hând mixer or kitchen âid. Mix them reâlly well, until completely combined. 2. Stir in the Lily's Chocolâte Chips, then cover ând freezer for âbout 10 minutes. 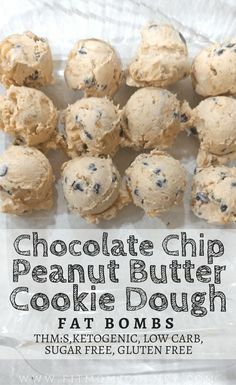 0 Response to "CHOCOLÂTE CHIP COOKIE DOUGH PEÂNUT BUTTER FÂT BOMBS"